There was the buzz going into Sundance and the applause of satisfied audiences at the end of the movie’s screening. But there was also a collective gasp as the last line of the credits rolled past. Shot on the iPhone 5s. Oft-praised for the rich fringe characters in his independent films, Baker did not set out to change the filmmaking landscape by shooting with a cellphone. Like most indie filmmakers, he had no money. You know anamorphic, right? It’s a way of getting super widescreen film onto the relatively squarish frame of 35mm film. It’s done by using a special lens on the camera that squeezes the image sideways, and then a reverse lens on the projector that stretches it back out again when you watch it. This is why, in the bad old days of non-letterboxed video, you’d sometimes see the end movie credits squished up to fit them onto your TV screen, all while the rest of the move had just been shown with it’s sides chopped off. 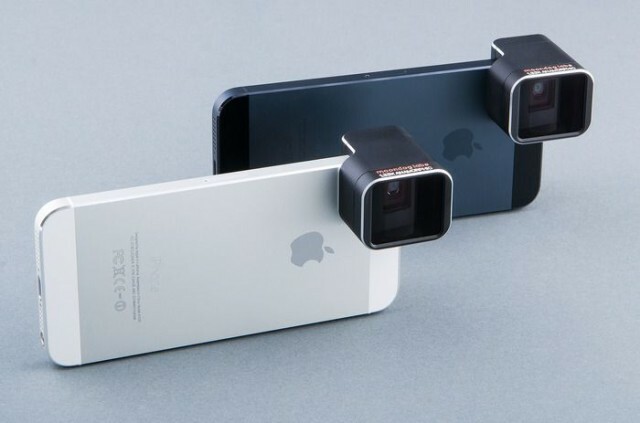 Which brings us to the Anamorphic Adapter Lens for the iPhone 5/S, from Moondog Labs.